Here we are again with some more ribbon microphones to test with voiceover. My previous article addressed the suitability of ribbon microphones for voiceover: Royer R-101 and DIYAC RM-5 Ribbons for Voiceover. This article will lean more towards a shootout and overview of how well these microphones perform on my voice. The microphones we get to shootout today are both from Shure: the KSM313 and the KSM353/ED. These microphones have their own very unique look. They feel extremely solid and well built. And I have officially given the KSM353 shock mount the “sexiest shock mount ever” award. Seriously, how cool is that shock mount? 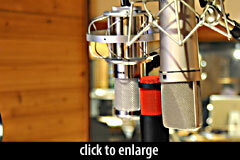 Both microphones are extremely easy to mount and angle with their corresponding hardware. This isn’t always the case with some microphones. Both microphones feature a fixed bi-directional (figure-8) polar pattern. What’s cool about the KSM313 is that front and back side of the mic sound completely different. The front side is warm and full while the back side is much brighter and open. Both sides of the KSM353 are identical. 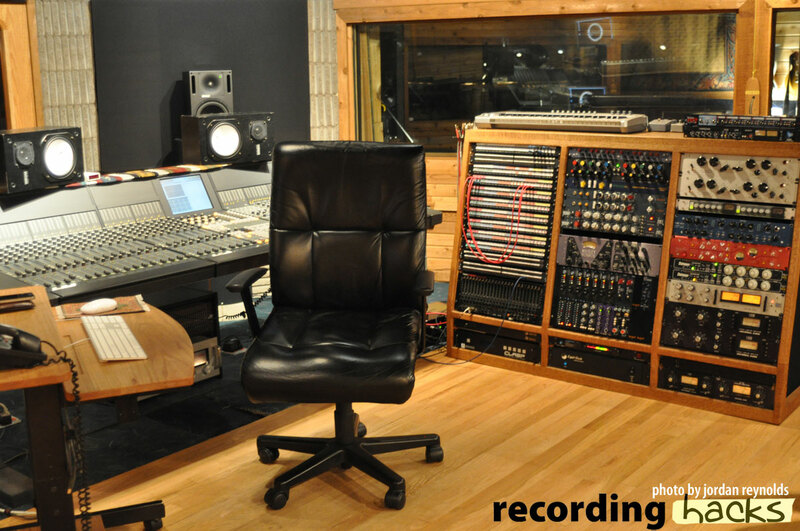 We decided to record the samples in a professional recording studio to ensure consistency. Oh, and to avoid my horrendous EMI (electro magnetic interference) problem I’ve recently discovered in my studio — but we’ll save that for another time. 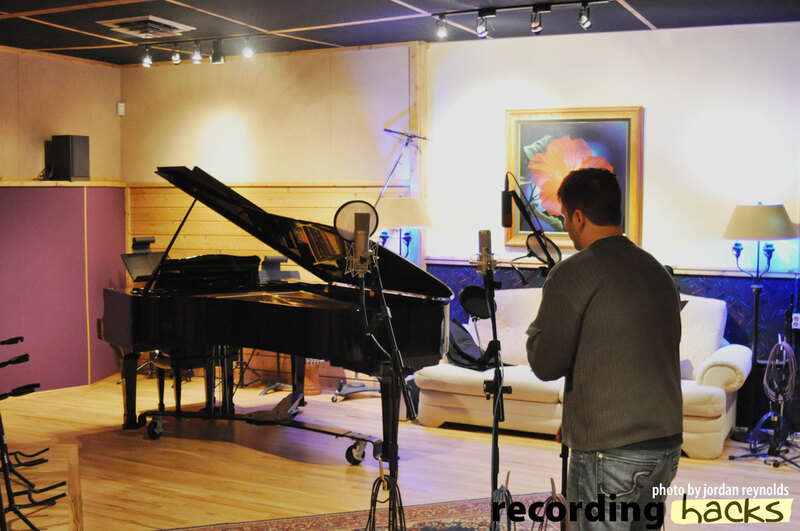 The samples were recorded at the beautiful Colorado Sound Studios with audio engineer J.P. Manza. 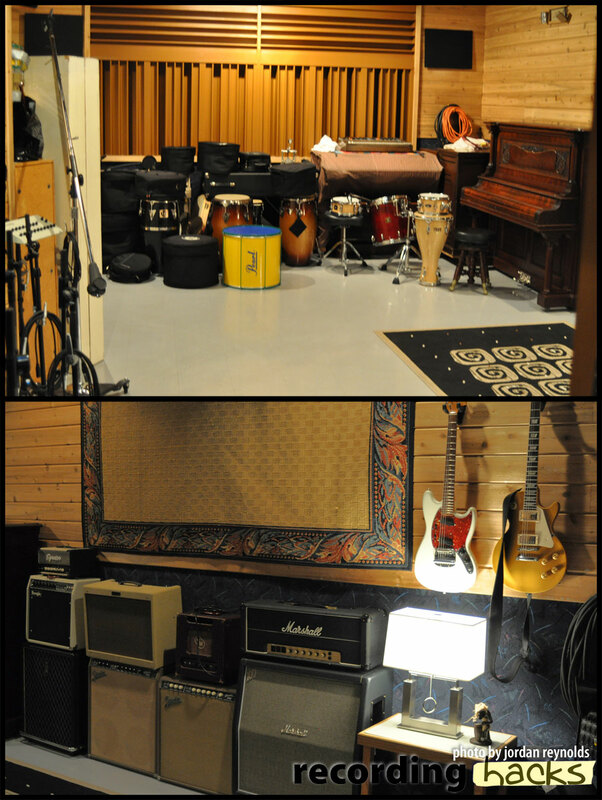 We recorded in Studio A. J.P. set me up in “the wood room” — it wasn’t too live or too boxy, but just right for voice over. 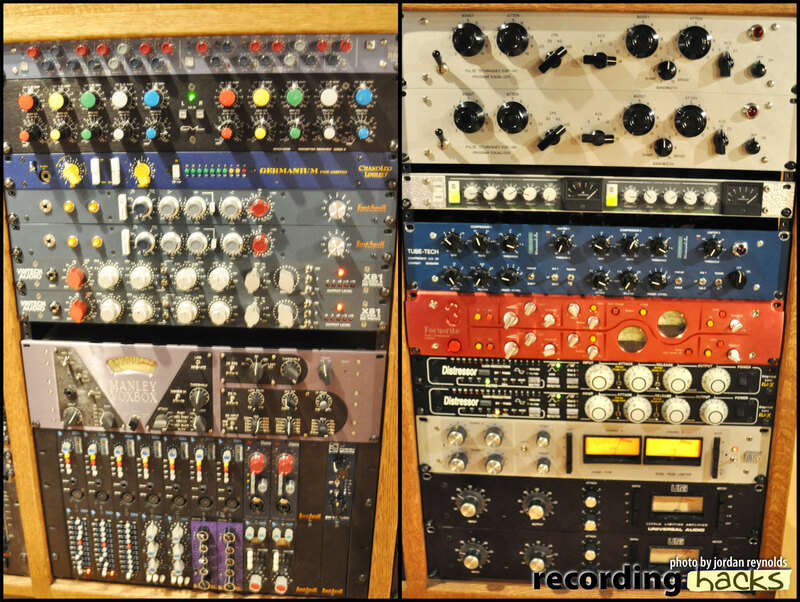 Colorado Sound has a drool-worthy amount of gear in their racks. I attempted to take some photos for the readers to drool on too [mind your keyboards, eh? –Ed.]. My experience with the staff and facility at Colorado Sound was nothing but fun and easy. 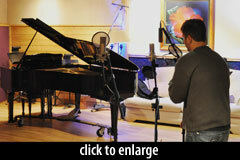 If you’re looking for a recording studio in the Denver metro area be sure to check them out. Because this was a shootout, we wanted the cleanest signal path possible. So we went with a Grace M802 preamp. Readers of my previous ribbon mic article suggested including a condenser microphone for comparison purposes. This was a great idea so, this time, we did just that. 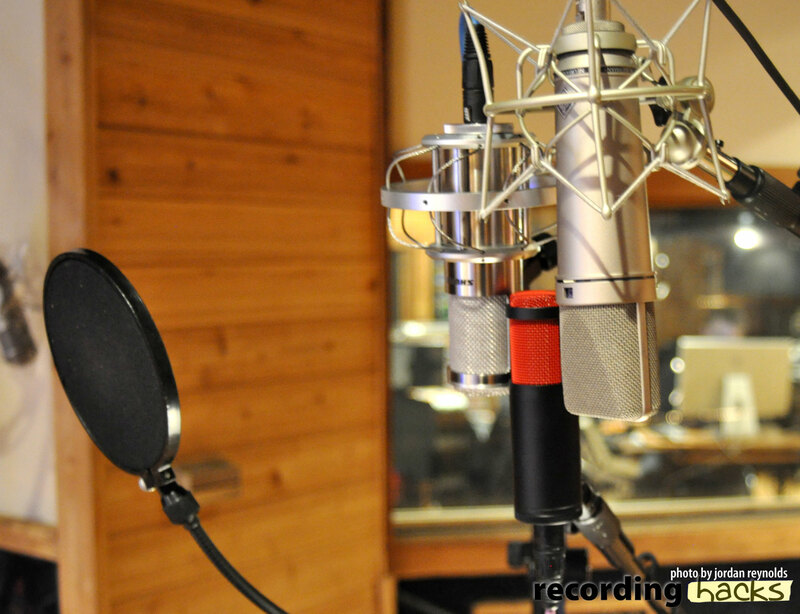 We mounted up a stock Neumann U 87 Ai — a voiceover staple. The microphones were recorded in pairs. J.P. precisely angled each mic in each pair. Each pair of recordings below are the same recording/take. Important Note: We played with the distance between my mouth and the microphones to find the sweet spot for the ribbon microphone only. This article was intended to review the ribbons, not the U87Ai. Please keep this in mind when listening to the samples. These mics sound quite different from each other. The KSM313 was decent in the lows but had too much midrange boost. The KSM353 had a very focused and tight low range with a well balanced amount of mids and highs. Keep in mind the front side of the KSM313 is the “warm” side. The KSM353 would be my choice for this read. As I’m sure you noticed the ribbon microphones sound extremely different from the U87Ai. The ribbons both sound warm and rich while the U87Ai sounds bright and crisp. When listening back in the control room I mentioned that the U87Ai almost sounded too thin. J.P. informed me that the sweet spot distance for the ribbons was certainly not the same as for the U87Ai. He said if we were only using the U87Ai he would have placed it just 1–3 inches away, not 10 as in this test. I absolutely loved the backside of the KSM313 on this read. It had such a great balance across the frequency spectrum. It tamed those harsh peaks in this more aggressive read without sounding too muddy or flat. It’s interesting how subtle the differences are on this read versus the commercial read. The KSM313 is much more “usable” in this example. The mids aren’t so boomy this time. This is probably because I’m reading at a much lower pitch and volume. Again, the KSM353 has that overall rounded tone that is extremely pleasing to listen to. I love both mics on this read, but the KSM353 takes the cake again, by a margin. Once again the rearside of the KSM313 makes a huge difference when used for voice over. The KSM353 also showcased its balanced and rounded tone. I feel that ribbon microphones apply their own form of “natural compression.” For voice over, I may actually prefer this kind compression over a conventional compressor. It is very transparent sounding. Typically, narration reads will be heard for many minutes or hours. 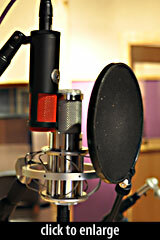 A microphone that features a warm and smooth tone is ideal. Both of these ribbon microphones achieve this. I have to emphasize how important it is to find the sweet spot of a ribbon microphone. Ribbon microphones can start to sound boomy very quickly without optimal placement. You’re typically going to be speaking about 7+ inches (usually more) from a ribbon microphone. The sweet spot will also vary on the style of read. Use your microphone technique skills on a script by script basis. For example, I was speaking about 10'' away from the microphone on my louder and aggressive commercial read and 7'' away on my more intimate narrative read. 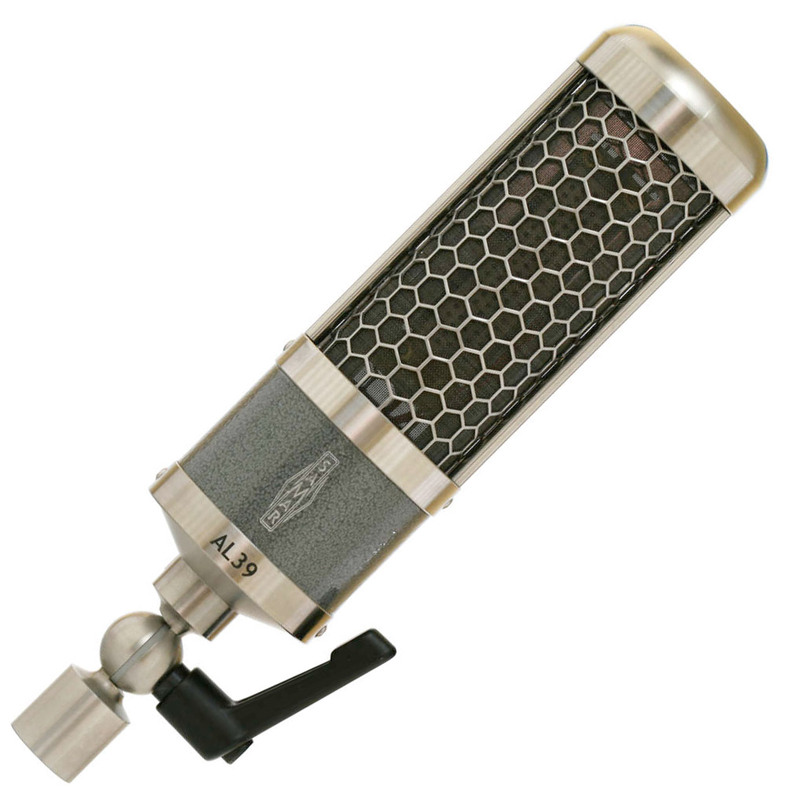 If you’re looking to pick up your first ribbon microphone for voice over I highly recommend the KSM313. Having two distinct sounding sides is like having two microphones in one. It is well-priced for the features and sound quality it produces. This mic has already been added to my ever-growing gear lust list. The KSM353 is also a stellar microphone. What can I say, I’m having a love affair with the shockmount alone. At a street price above $2500, the microphone doesn’t exactly fall into a typical home studio budget. But if you can afford it, it would only benefit your microphone arsenal. In my dream world of owning both microphones I’d prefer use the KSM353 for commercial work and the KSM313 (backside) for narration. However, the KSM353 was still very qualified for narration work too. I’d even call it a “workhouse” studio ribbon microphone. If you record more than just voice over then this microphone becomes even more valuable. 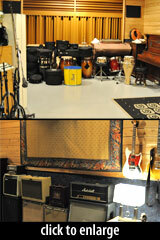 The KSM313 sounds beautiful on multiple sources, most notably brass and electric guitar cabs. The results of this shootout only reinforce the idea that ribbon microphones deserve a role in the world of voice over. They showcase an entirely different sound and perspective to the human voice. Who doesn’t want diversity in sound and color when it comes voice over? So far I’ve heard four different ribbon microphones on my voice — each with its own unique character. Watch out, because I think ribbons are making a steady come back to the voice over industry. Huge thanks to Matt McGlynn, Shure, the staff at Colorado Sound Studios, and the awesome readers and commenters here at RecordingHacks.com. I’ll echo Jordan’s thanks to the staffs at Colorado Sound and Shure. Thanks also to Jordan for putting this review together. Standard disclosure: the microphones in question were loaned to us for evaluation purposes. Unfortunately, we don’t get to keep them. A note for readers: I’d asked Jordan to use the same VO scripts as in his earlier review, enabling you to compare the two Shure ribbons to the Royer R-101 and DIYAC RM-5. 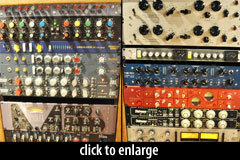 Find those audio samples here, but beware of gain levels — the earlier samples are hotter. Alternatively, you can download the gain-matched 24-bit WAV audio for all five ribbons (RM-5, R-101, KSM313 F, KSM313 R, and KSM353) here. I agree with both J.P. (you’re too far from the U87) and you (the backside of the KSM313 sounds *great* on your voice). The U87ai sounds better at this distance. But I still prefer the ribbons, with the Shure KSM313 (rear) still taking the cake for its perfect balance of smoothness and clarity. Would it be proper to mention that these microphones were designed and tuned by the medical inventor Robert Crowley? 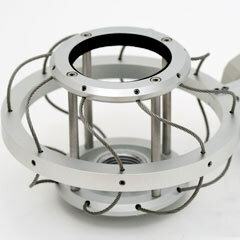 Crowley is quite famous for new materials like acoustic nanofilm (roswellite). 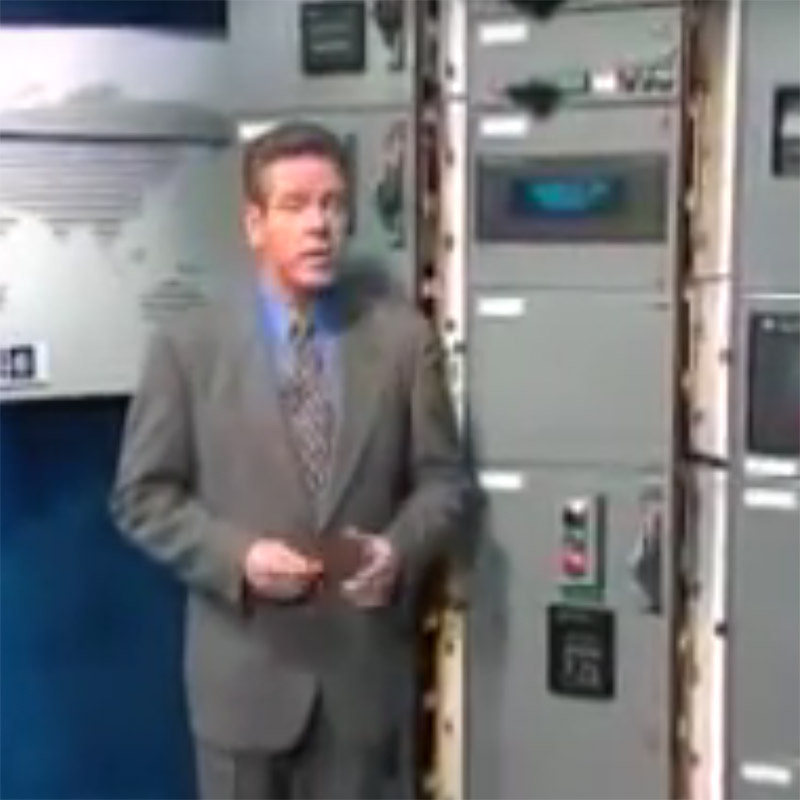 The mics you show were called Naked Eye and el Diablo. He set out to make voices sound better with his Crowley and Tripp mics. Shure came in and snapped it up – I was there for part of it. I have to say, the U87 sounds overly strident in these samples, in comparison to what it normally sounds like. I also noticed a bit of hum on the KSM 353, which was not in the chain of the U87 or KSM 313. I really like the sound of the KSM 313 on your voice, has a “soothing” richness, great for narration. @Gus, the history of the Shure KSM ribbons is pretty well documented elsewhere on the site — just click on any of the microphone photos in this article to see their profile pages, which describe the mics, components, and origins in detail. 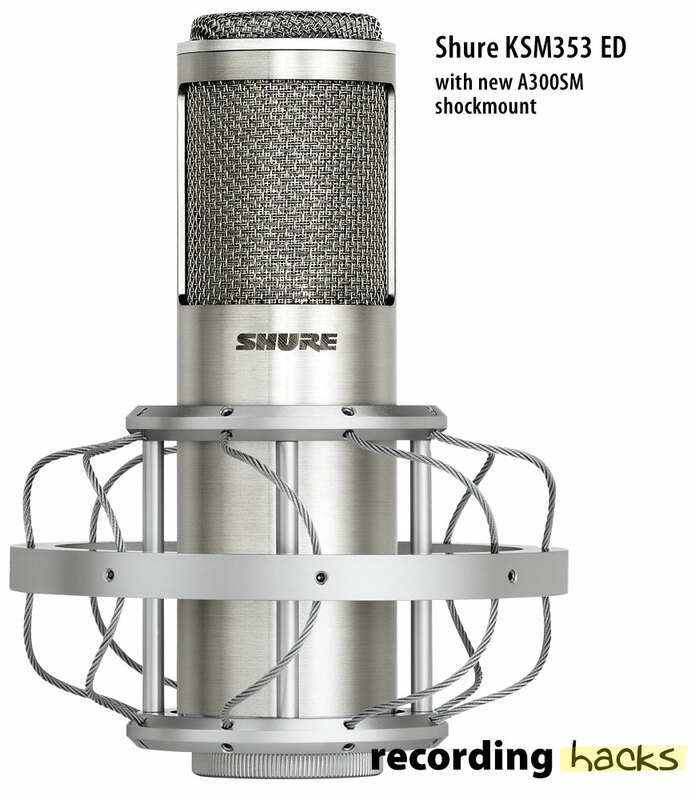 Ironically, you “sell” the KSM313 (backside) better on speech than Shure does! The U87 is ok maybe it is not the right proximity but this is 100 times better even at this distance. mics to sound excellent in these examples. Very forgiving and natural. quality products and matched well when we tested a naked eye to the 313. But, that was ridiculous to put an 87 10″ away. We would put a pop on an 87 and put the vocalist about 3 in from the diaphragm. 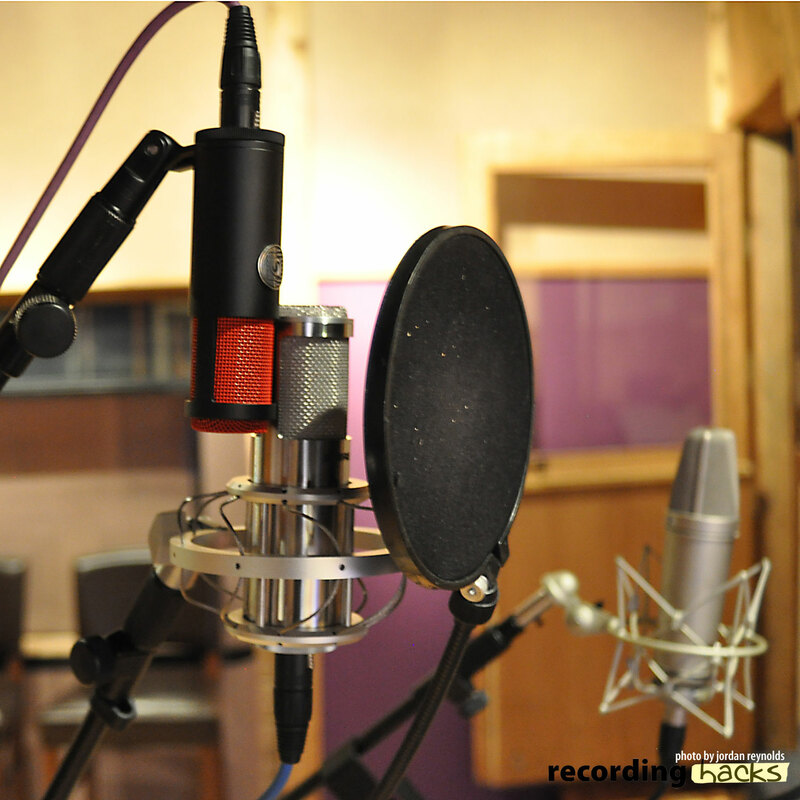 On the other hand, we have put a lot of vocalists on Sennheiser MKH416’s, MKH60, Neumann KMR 81i depending on the source materials which often relate to a video take. All in all, I really like these hybrid ribbon mics with the nanofilm (Roswellite). 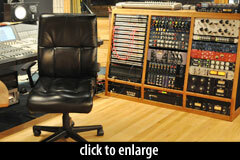 I would recommend them for multiple uses in the studio. Great examples at lest with the Shure’s. Loved the voice samples guys! Thanks. 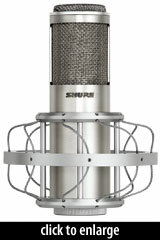 Any thoughts on mic pre’s for these two Shure ribbons? Do they need a lot of good, clean gain, or do you think they’d still perform well with a “lesser” mic pre? The Grace m802 is not going to be an option for me, I’m afraid. Hi. Just stumbled on your wonderful demo having put up one this week pitting my Coles 4038 (plus Fethead) against a Rode NT1A. Had no idea nanofilm was already in mics! Love the vocal sound. I felt differently about ribbon mic then the other guy. I think they are fantastic I am going to start using them for my vocal. U87 is okay? U must of have really bad ears or your are off the axis.